Prof Hayakawa from Gunma university got served a written warning by the president of Gunma university. Though Gunma university is almost meaningless for the world, Prof Hayakawa has been doing the great job by making the detailed radiation map. He is an expert of volcanic ash. He used his knowledge, he estimated the flow of the plume and made the map which is more accurate than the one of the government. He also warned about eating vegetables from eastern Japan based on his own map, which is very rational. 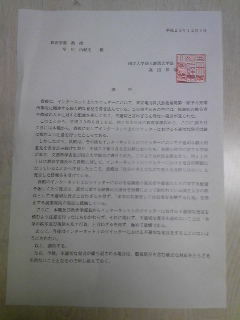 Stakeholder of the farmers or Tepco complained to Gunma university and had the president warn Prof Hayakawa. Our university is a national university run by government’s tax. However, Prof Hayakawa’s comments on the internet have been hurting Fukushima people or farmers. It violates the employment regulation not to damage the name recognition of Gunma university. We expect you to refrain yourself on the internet. If you repeat this kind of inappropriate speech ,we will take any disciplinary action against you.